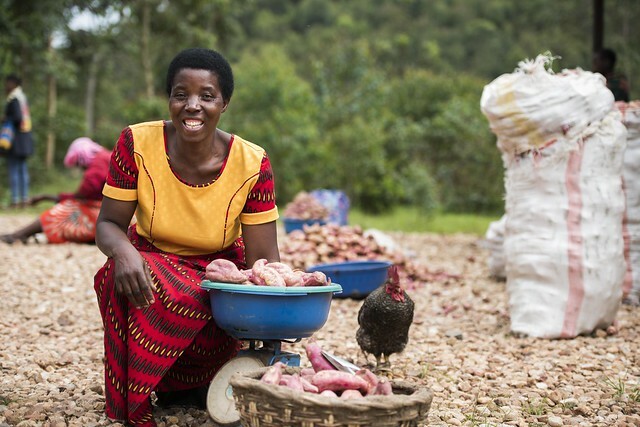 The CGIAR Collaborative Platform for Gender Research hosted the webinar ‘Ensuring gender-responsive plant and animal breeding – A practical decision checklist’ on Thursday May 17. The webinar was organized in collaboration with the Gender and Breeding Initiative (GBI) and the CGIAR Research Program on Roots, Tubers and Bananas (RTB). The webinar presented the structure of the tool as it reflects on the different stages of the breeding cycle. It also provided some practical examples and insights on the use of the checklist in a specific breeding program. Participants were able to discuss and interact with some developers and users of the tool to learn more of the potential contribution of the tool to specific breeding programs. Graham Thiele is a social scientist and expert in targeting, priority setting, and impact and adoption studies of new agricultural technologies. He spent 17 years with the International Potato Center (CIP), most recently as the Leader for Social and Health Sciences. Graham has worked in Bolivia, Ecuador, Peru, Tanzania, Kenya, Benin, Rwanda, Indonesia, and the Philippines. He helped develop, implement, and assess several, novel participatory methodologies designed to link farmers with markets, inform research agendas, and promote innovation in policies, products, and technology uptake. Graham holds a PhD in Social Anthropology and an MSc in Agricultural Economics. Jacqueline Ashby is a development sociologist, researcher and teacher with international development experience in organizational change, technology development and poverty reduction in agriculture and food systems. She has worked as a researcher and in senior management in the CGIAR at the international Center for Tropical Agriculture (CIAT), the International Potato Research Center (CIP) and as senior adviser for research on gender at the CGIAR System Office until retirement in 2017. Her special interest is in participatory research and citizen science in agricultural Research and Development and she contributed seminal work to the application of farmer participatory research for use in plant breeding. She has also advised widely on gender mainstreaming. Dr. Ashby received her PhD from Cornell University and has served as a Board of Trustee member for several international research organizations. Pricilla Marimo is a CGIAR gender postdoctoral fellow based at the Bioversity International office in Kampala, Uganda. Prior to joining Bioversity International, Pricilla worked as a Research Manager at the Center for the Study of Development Economics at Northwestern University, USA. She was also a Research Fellow at The African Centre for Gender – United Nations Economic Commission for Africa (UNECA) and is a recipient of the American Association of University Women (AAUW) International fellowship. Pricilla holds a PhD in Economics from the University of Exeter (UK), an MSc in Agricultural and Applied Economics from Virginia Tech (USA) and a BSc in Agricultural Economics from the University of Zimbabwe. Dr. Robooni Tumuhimbise is a Senior Banana Breeder at the National Agricultural Research Organization (NARO) in Uganda. His agricultural research experience spans over 10 years, and his interest is in the development and promotion of farmer-acceptable, high-yielding banana varieties, with resistance to pests and diseases. Robooni has led a team that released four high-yielding cooking banana varieties improved for resistance to black Sigatoka, weevils and nematodes. Prior to joining NARO, Robooni worked as the General Safety Inspector in charge of agricultural inspections in the Department of Occupational Safety and Health, Ministry of Gender, Labour and Social Development, Uganda. He also worked as an Agronomist/Extension Officer at the Swedish Co-Operative Centre -VI Agroforestry, Uganda. Robooni holds a PhD in Plant Breeding from the University of KwaZulu-Natal, South Africa; an MSc Crop Science–Agronomy and a BSc from Makerere University, Uganda. Because of a routing error, I didn’t get my question in on time at the end of the webinar, and I’m following up on Ewen’s suggestion to post it here. Great presentations by all. The checklist is an excellent tool and it hope will generate discussion, adaptation and adoption by breeders. My question for Pricilla and/or Robooni: The studies that will provide information to develop a full trait portfolio for banana in Uganda seem to be well-considered and timely. What do you see as the specific timeline to reach the stage where new varieties with this new complement of traits, defined through the checklist process, could have a gender impact? Do you expect that breeders will be able to find those traits in advanced breeding materials and perhaps have new varieties in a few years? Or is it more likely that breeders will have to start at the beginning, with selecting new parents, making crosses, and the full testing/selection scheme in order to bring in these traits? In this latter case, you may be looking at 2-3 years for defining the trait portfolio, 10 years (?) to breed and fully test a new variety, and 4-5 years for significant impact. Have you developed alternative roadmaps for breeding gender-responsive varieties, that take into account these different scenarios? What are donor and research manager expectations with regard to such a time frame? Again, congratulations on the great work at NARO. My question was for Jacqueline. She had a slide showing gender differentiation in use of a specific variety which she attributed to gender preference. My question was whether a similar differentiation might not result from a gender gap in access, even if men and women had similar interest in the variety? How would we distinguish between these possible causes as they would have very different implications for product profile design? Now that I have more time to think, another question comes to mind: In maize, there seems to be the development of two separate markets which are quite distinct – one is grain for sale and the other for home consumption. Maize for home consumption tends to utilize older varieites which have taste or culinary properties which make them difficult to improve or replace. At the same time, the commodity market is very price sensitive, so urban consumers are impacted greatly by supply instability. Given that breeding for the texture and taste preferences of local home-use varieties will necessarily slow progress on all other traits related to input use efficiency of the crop (final yield), how do we factor in the needs of poor urban consumers during the product design phase? If we breed for culinary properties at the expense of yield because women farmers prefer these traits, what is the impact on low income men and women urban (or off-farm) consumers? It is plausible that niche markets could (will) develop for grain from these home-use preferred varieties (as they are for Mexican maize smallholder farmers), but these products are not affordable for poor consumers.